The warm weather is back, and with it Chicago's iconic weekend mass shootings (which somehow never make it to the front pages). Twenty four people were shot in 24 hours in Chicago between April 6-7, including three adults and three children, who died from gunshot-related injuries, according to the Chicago Police Department. The mayhem started early Saturday morning and continued into the afternoon hours on Sunday. Police, and common sense, both allege that warmer weather was responsible for the surge in violent crime. During the weekend horror, Chicago police investigated multiple homicides and a mass shooting of six people in West Englewood. Three people were shot in East Garfield Park at 3:30 am Sunday. A 34-year-old was taken to Mount Sinai Hospital with a gunshot wound to the leg, a 26-year-old was taken to Norwegian American Hospital with a gunshot wound to his foot, and a 33-year-old was taken to Rush University Medical Center after he was shot in the arm. 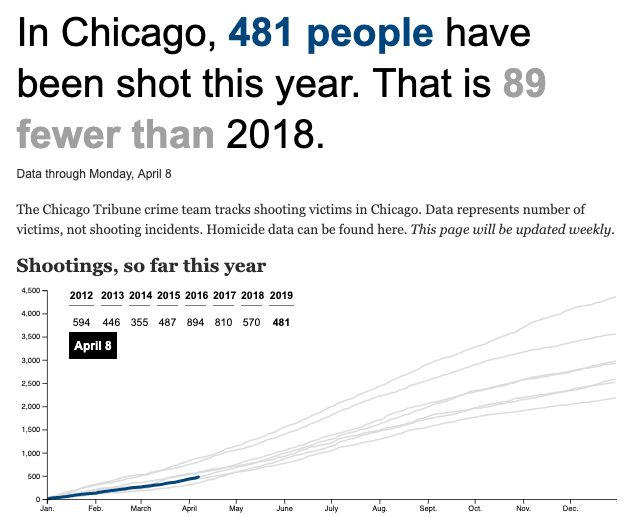 There is some good news: so far in 2018, Chicago shooting are trending about 20% below 2018, and well below the recent record hit in 2016, when nearly double the number of people had been shot through April 8. A teenager was shot to death Saturday afternoon, in the 1700 block of West Steuben Street in Morgan Park. About 6:10 a.m on Sunday, officers found a 32-year-old man, shot in the back multiple times, was transported to University of Chicago Medical Center, where he was pronounced dead. Two of the three homicide investigations were conducted on Sunday. About 8:30 a.m. officers found a man, 52, with a single gunshot wound to the head at the 700 block of South Normal Boulevard in Englewood. He was pronounced dead at the scene. Chicago Tribune listed the other shootings: "A 13-year-old boy wounded in the 1200 of West 73rd Street in Englewood, a 45-year-old man wounded in the 2000 block of West 68th Place, a 28-year-old man was wounded in the 5100 block of West Madison Street in South Austin, a 28-year-old man wounded in the 4900 block of West Hubbard Street in South Austin, a 29-year-old man wounded in the 4100 of West Belmont Avenue in Kilbourn Park, a 30-year-old man wounded in the 400 block of East 103rd Street in Roosemoor, a 29-year-old man wounded in the 7900 block of South Halsted Street in Gresham, a 27-year-old man wounded in the first block of East 102nd Street in Roosemoor, a 20-year-old man and a 43-year-old man wounded in the 10300 of South Corliss Avenue in Roseland, a 39-year-old man wounded in the 200 block of North Long Avenue in South Austin." 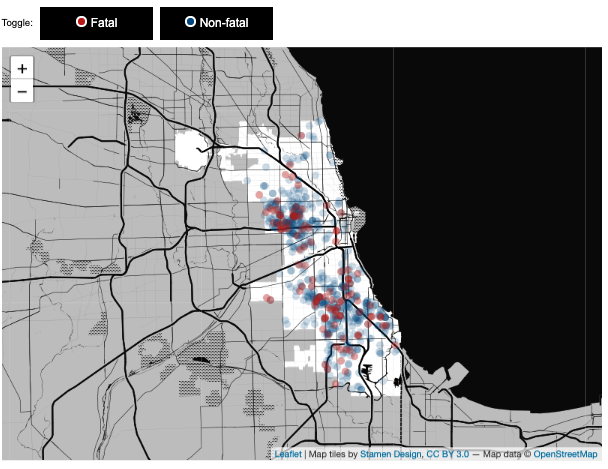 As temperatures soar, so does violent crime in concentrated urban areas. Besides Chicago, Baltimore, Detriot, and New Orleans also suffer from out of control gun violence, despite strict weapons restrictions: it is almost as if criminals choose not to obey gun control laws. 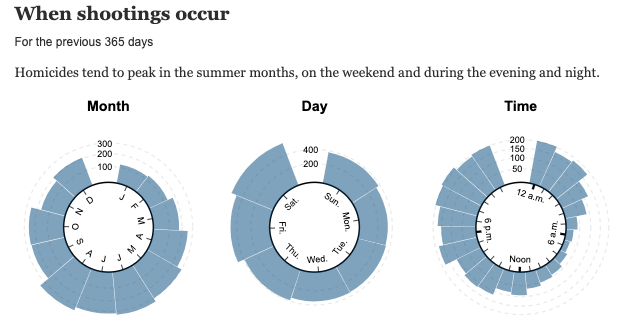 Shootings in the Windy City tends to rise in spring, peak in late summer months, then trough in late fall and winter. Temperatures over the weekend were above average, so far, the hottest day of the year. "Temperatures certainly rebounded in the Chicago area this weekend versus temperatures in March and even the first few days of April. During March, the temperature averaged 3.6°F below normal at Chicago-O’Hare, with two days reaching the low to middle 60s during the month. This past weekend, the high was 66°F on Saturday and 67°F on Sunday, the warmest days of 2019, respectively (before Monday’s high temperature of 73°F). With some sunshine, the weather was very favorable for outdoor activities during this time, reported Meteorologist and owner of Empire Weather LLC., Ed Vallee. Warm weather encourages people to go outside, where more social interactions occur. Probabilities of violence tend to soar on hot days, especially in neighborhoods where 15–24-year-old unemployment rates are elevated.